The neck or cervical spine is made of 7 different bones known as vertebrae. Important nerves exit the neck that allow the arms and shoulders to move and function. For example, the nerve that is involved in carpal tunnel syndrome begins in the neck. Stiffness and pain often develop due to a LACK of movement in this region. Prolonged typing, texting, driving is often associated with neck stiffness. 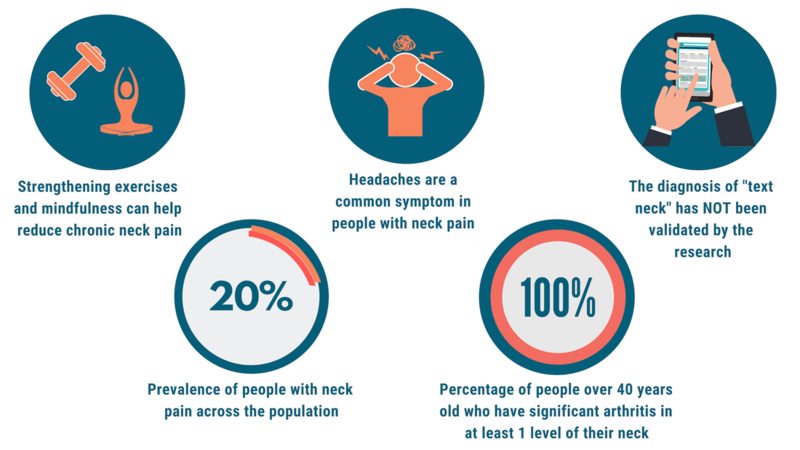 Despite nearly 100% of people having arthritis in their neck by the age of 40, all people do not have pain. This means one's imaging findings do not always correlate with their pain. Instead, the research shows that following an exercise program, receiving quality education, and incorporating mindfulness are keys to returning you back to the activities you enjoy most! You just learned about neck pain in general, now follow our neck pain exercises, soft tissue videos, and additional neck pain advice below.